This tutorial will show you how to delete the Windows.old folder in Windows 10. When you upgrade from a previous version of Windows, Windows 10 will create a Windows.old folder which it will delete automatically after 30 days. For 30 days you still have time to rollback to previous version using this Windows.old folder. If you do not wish to go back to previous of Windows then you can reclaim your hard disk space by deleting this folder. Note: If you delete Windows.old folder, you will not be able to go back to previous version of Windows. Open Disk Cleanup by pressing Windows + R key combination, type in cleanmgr and press Enter. 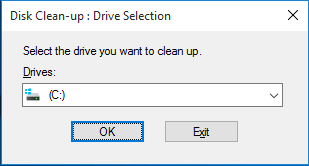 Select C drive and press Ok to proceed. Click on the Clean up system files button. Check Previous Window installations and click Ok to proceed.